1979 - The Jacksons perform Destiny tour in Syracuse[US]. 1988 - Michael performs BAD tour at The Palace of Auburn Hills in Detroit [US]. 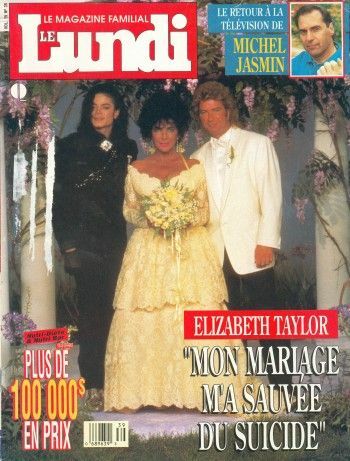 1991 - Le Lundi magazine[France] featured Michael & Liz on their cover with the headline: Elizabeth Taylor - "My marriage saved me from suicide"
2001 - Michael participates in an Online Audio Chat with his fans hosted by Yahoo & Get Music, sponsored by Rolling Stone. With music critic/writer Anthony DeCurtis, he answered questions from fans via telephone about the new album, the recording process and his music. His favourite songs on INVINCIBLE are Speechless, The Lost Children and Unbreakable. The song Speechless was inspired by ‘two sweet little kids’, a boy and a girl, with whom he had a water balloon fight in Germany: ‘they are so innocent, they are the quintessential form of innocence. Just being in their presence, I felt completely speechless’. While working on an album, he sometimes writes 10-12 songs, only to throw them all away and start over. He sometimes makes musicians do things 100 or 1,000 times, to make it the best it can be. They may get angry at him, only to ring him later, to admit that he brought out the best in their performance. 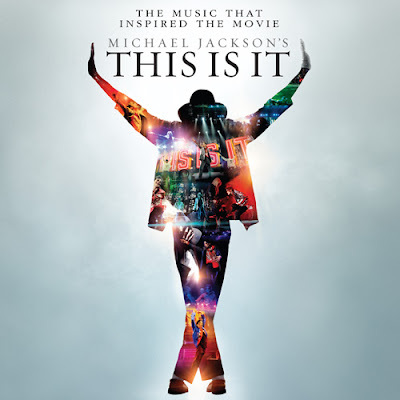 2009 - THIS IS IT (The Music That Inspired The Movie) album was released internationally on October 26, and worldwide the following day. The two-disc album features music 'inspired from the documentary of the same name'. Disc one feature the original album masters of some of Michael's biggest hits arranged in the same sequence as they appear in the film and ends with two versions of the 'never-released' This Is It. This song is featured in the film's closing sequence and includes backing vocals by Michael Jackson's brothers, The Jacksons. "The second disc featured "previously unreleased versions" from Jackson's 'catalogue of hits' and also include a spoken word poem entitled Planet Earth (which originally appeared in the liner notes of the Dangerous (1991) album) and a 36-page commemorative booklet with photos of Michael from his rehearsal. THIS IT IT debut at #1 on the Billboard 200 album chart, marked Michael's 6th #1 entry on the chart, with the sales of over 373,000 in its first week of release. This Is It's chart performance tied Jackson with several other artist for the most #1 albums on the Billboard 200 chart; among the solo male artists, Jackson currently is tied with Garth Brooks for 2nd place with 51 entries. This Is It debuted at #1 in fourteen countries, including the U.S., Canada, Japan, Italy and France. This Is It peaked within the top 10 of the charts in other nations. This Is It has been certified Gold, Platinum, and twice-Platinum in multiple countries. This Is It was the twelfth best selling album of 2009 in the United States having sold an estimated 1.29 million units since its release of nine weeks, and the 3rd best selling album of 2009 based on worldwide sales. This Is It has sold over five million copies worldwide. Matchbox Recordings released an incredible charity single featuring a group of young entertainers from Merseyside, Liverpool. The single by "Bulief" is a cover of Michael Jackson's hit "Heal the world" and is in aid of the Red Balloon Learner centre in Liverpool in the name of James Bulger House. The small scale charity single released, not only in rememberance of James but as a way to gain funding for JBH, which raised £10,000 the fund-raising night. Michael Jackson has given his socially-conscious song, "Heal The World" to a group of young entertainers from Merseyside, Liverpool, to help raise money for the "James Bulger Red Ballon Centres Appeal", established by his mother, Denise Fergus from Kirkby, Merseyside. James Bolger, her 2 year-old son was killed in 1993 by 2 teenagers. With all proceeds being funnelled to James Bulger House (a school for bullied children). Michael Jackson was aware of James, he sent a large basket of flowers to James Bulger's mother Denise Fergus after his murder with a very personal letter. He wrote a couple of lines for James and he named it 'Child Of Innocence'. Michael was in support of and aware of the single and it had been featured on his official website. James' mom says: "Even at the young age of two James was a huge Micheal Jackson fan, and so it felt right that we sing a song he loved in dedication to him. We played Michael's song at James' funeral. I've listened to 'Heal The World' over and over again and it gave me such a buzz when we found out we could release it to raise money for the JBH. The words in the song are very touching. I feel the world does need healing with children committing crimes. It is very upsetting the way the world is at the moment, bullying is going on everywhere." This entry was posted on 26 October 2010 at Tuesday, October 26, 2010 and is filed under 1979, 1988, 2001, 2009 . You can follow any responses to this entry through the comments feed .